Members Billington, Bradley, Collins, Farmer, Forwood, Fysh, Golding, Hindlev, Hutchings, Rhodes, Rumsey, Small and P. Smith supplied the information for this 1963 appraisal of the narrow gauge industrial systems in North Wales. Like many a Government survey it is already well out of date, but the overall picture which it gives will be of considerable interest in the years to come. Recent times have seen a marked decline in steam traction and an inexorable shrinkage of narrow gauge mileage. In fact, as we go to press the closure of the entire rail system at Penrhyn is imminent. – Hon. Ed. Interest in 1962 was focussed on the abandoned 4ft gauge line and 1963 saw virtually the end of it. VELINHELI and the Hardy loco had been cut up by April with wheels, cab and frame only of the former present. These locos had been purchased by a scrap dealer in Caernarvon. Evans, but he had been persuaded to defer scrapping the other two 4ft gauge locos, DINORWIC and AMALTHAEA, until plans were made to preserve one. However, these fell through and, the management tiring of seeing the locos lying about. Evans cut them up in August immediately after the summer holiday. In June one transporter wagon and the saloon coach were in "Hardy's" shed. The track was being lifted – from the incline top to the works was just finished and a start was being made on the lines towards the far end. On the incline itself the track was in situ. The disposition of quarry locos in August was as follows: On the old platform were the dismantled remains of a loco, stated to be LADY MADCAP. On the ground level were RH 221605 on the near side of a long tunnel and VELINHELI and SYBIL on the far side. One level up on the same side of the tunnel as the latter was DOLBADARN. A disused level several levels up produced KING OF THE SCARLETS and MICHAEL (out of use) whilst several further levels up was a very long line with RH 277265 parked in the open and MAID MARION and BERNSTEIN (both in use) and ROUGH PUP (derelict) all in one shed. (This shed has a "false" back behind which was ROUGH PUP.) About three levels above was ALICE (disused) and several levels below her, but much further west in a different part of the quarry, HOLY WAR was in use. Workable steam locos in June were distributed as follows: Top level – WINIFRED (in use) in the best condition of the lot. Second level – OGWEN and GLYDER (both in use). First level – MARCHLYN (in use). Main level – CEGIN (in use). Works NESTA and BLANCHE. CHARLES had recently gone to the Penrhyn Castle Museum, and PAMELA had been moved from the Works to the old shed that has been the home for so long of the small Hunslets. Later in the year BLANCHE joined her sister loco LINDA on the FR – indeed, but for LINDA the latter would have been unable to operate a full service that season. 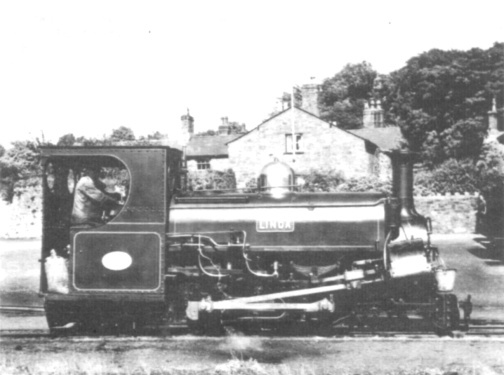 Other locos going for preservation in 1963 included JUBILEE 1897 to Towyn Museum and LILLA to Mr. J.B. Latham at Woking. In August SGT. 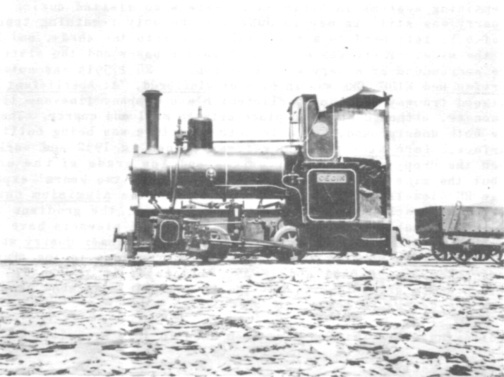 MURPHY was noted in the Works as "very decrepit – for patching up prior to sale" to Mr. T. Burdett of Louth (intended for use on the Lincolnshire Coast Light Rly.) Also in August SKINNER was reported present to the extent of wheels, frame and cab; of SANDFORD only two sets of motion with cylinders attached. A number of heavy weights were laid on SANDFORD‘s frame which was then converted into a brakevan and painted grey; this was in a line of locos between a building in the works and the line to Port Penrhyn. The diesel loco reported in the old shed on the opposite side of the bridge to the works turned out to be an ordinary diesel compressor on a wagon frame! The shed at Port Penrhyn was empty. At the Castle Museum CHARLES was in spotless condition, together with a 4ft gauge velocipede from Dinorwic and the lovely Penrhyn passenger coach. Also here were BECKTON No.1, KETTERING FURNACES No.3, L.N.W.R. 1054, and VESTA from John Summers & Sons Ltd., Shotton. 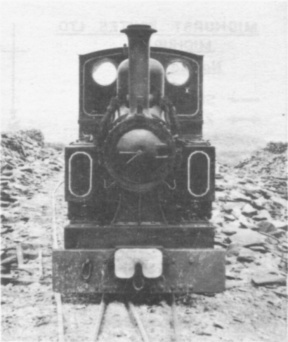 The working model of the Penrhyn main line, built by pupils of the Penmaenmawr County School, was withdrawn because of thefts. Though devoid of steam traction, this quarry still had enough steam locos on the premises to tempt the enthusiast, but some plates were stolen off the Hunslets to the understandable annoyance of the owners. 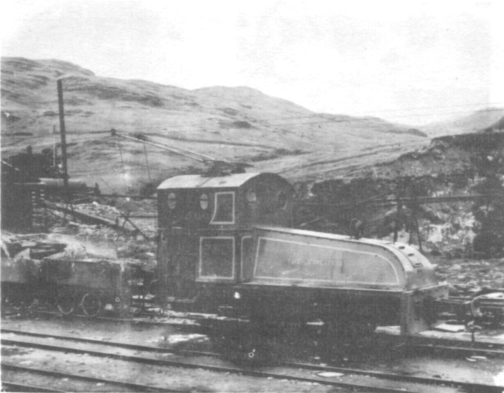 About twenty—four wagons were to be found on the Nantlle Railway in April when diesels No. 1 and 4 were working. 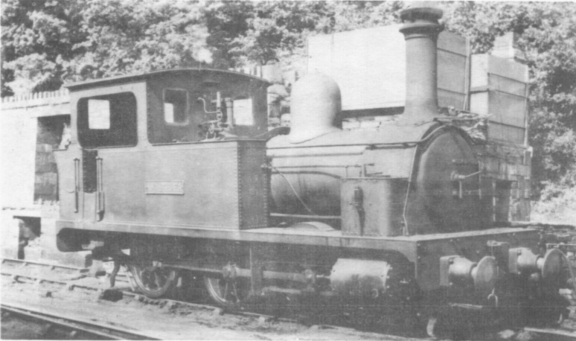 August found DIANA in a slate-cutting shed "as derelict as the loco" on the first level, complete except for the top of the cab; also present were RH No.3 and the saddle tank of SYBIL. In the works was SYBIL (dismantled) and RH No.2, plus a 3ft 6in gauge wagon. The De Winton, exceedingly derelict, was in a ghostly old shed beside the works. Behind the shed were the frame and wheels of a petrol loco. On the third (working) level there was a diesel in the shed, and in another shed on the other side of the level near the cutting were BRITOMART and UNA, not in bad condition considering that they had been out of use some three or four years. In September SYBIL was moved to the home of Mr. A.J. Hills at Bickenhill, near Birmingham. Mr Hills is Chairman of the local FR Group. Upper – Maen Offeren, 19 August 1963. Typical slate trucks are on the right, a derailed gunpowder van on the left. The centre vehicle is a brake truck for battery locomotives which had insufficient brake power on the severe inclines underground; it will be noticed that the wheels (17½in. diameter) and brake gear are off a steam locomotive – but which one? Suggestions would be welcome. DOROTHEA still stands in the remains of her shed on the top of the hill, with her chimney rusted three-quarters of the way round. The shed is difficult of access now. 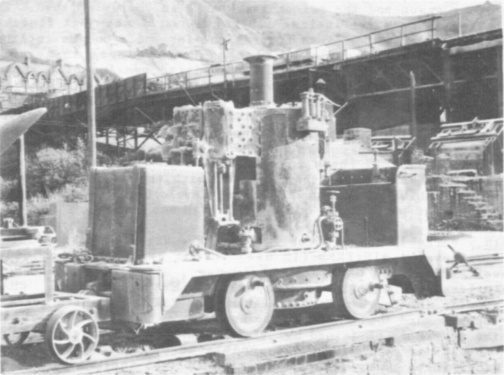 WATKIN, now on the quay, was one of four De Wintons (the others being HAROLD, ADA and LOUISA) used at the Graigllwyd Quarries; the other two, PENMAEN and LLANFAIR, worked at Penmaen East Quarry with PUFFIN. Amongst the other steamers, DONALD, STEPHEN, HUGHIE and SINGAPORE were also at Graigllwyd and DUTCHMAN at Penmaen. The disposition of the diesels in August was as follows: Second Bank – VIXEN, ALICE and TAFF. Penmaen (stored from December 1962) – LLWYD (MR 5951) and MR 5905. Braich Llwyd and Pencoed workings – MR 5941, 5950, 5024 and 5611, and WELLS (RH 202989). Graigllwyd – CRIMEA (RH 202987). The MR‘s were used in conjunction with one incline (the last gravity-worked incline in the quarries) from Penmaen and Pencoed, which was replaced by a conveyor at the end of 1962. Since them, most of the MR‘s have been stored and only one used as a works shunter. Three De Wintons were still present in August. PENMAEN was in a shed half-way up, incredibly derelict – just one mass of rust and cobwebs; LLANFAIR stood in the open right at the top with WATKIN on the quay right at the bottom. On the shore level (pier) in June the locos were 1, 3, 4 and 6 (respectively MR 5609, 7221, 5025 and HE 2208). These were last used in 1962 when a conveyor was put on the pier. Locos stored in the quarry were 10 and 11 on "0" Bank and No.5 on "1" Bank; these Hunslets were replaced by dumpers in 1961. A small 4−wheel internal combustion loco was reported at Greaves in July; it was in pieces in the dressing shed. DOROTHY was still at the back of the loco shed – she may be rebuilt as an electric loco. Two battery locos have gone from Votty & Bowydd (where the plant and equipment is being dismantled) to Aberllefeni quarries. One is ex−TAFFY (the one which does not have the Brush motor) and was painted green at Votty before despatch. Some of the more remote locations were visited in June. At the Ministry of Works, Bwlch-y-Slater Quarries at Manod was an RH, rusty and with bonnet missing, and an HE parked off the rails. 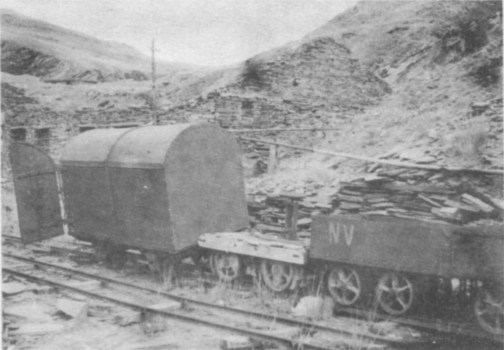 At Manod Slate Quarries there are two levels; the bottom one and dressing shed are hand-worked, but the top level which runs to the mine is worked by a battery loco and a Hunslet diesel (the latter now derelict). Cwm-Machno quarries were closed in 1962 and most of the track has been lifted since, but MR 2102 was still there in June. The 2ft gauge line from the LMSR goods yard to Duffws is in situ but Votty is closed and the incline to it and Maen Offeren rusty and overgrown. Only Oakeley showed any sign of life at all with RH 264252 (ex Votty) shunting the exchange sidings; it possibly takes slates from the quarry and over the high level tramway to Cwt-y-Bugail where there is a road to Ffestiniog via Manod. With pump storage control at Tan-y-Grisiau and the Atomic Power Station at Trawsfynydd, the locals have become selective in their choice of labour and the old concept of a long climb to the quarries being an essential part of the proceedings is dead. (Votty is understood to have closed because of the shortage of labour.) British Railways were building a connecting line from the LMSR station to the GWR, and the FR now stops at the LMSR exchange sidings. 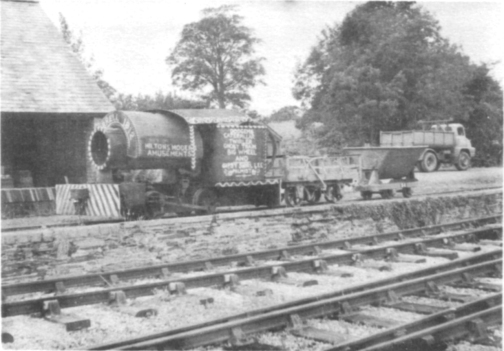 Two 2ft gauge diesels were carting cement in slate wagons from the mixer in the LMSR yard to the standard gauge line; these were THE FLORISTON FLYER (RH 375702) and L. I. D. (RH 186339). The remaining systems in North Wales were also visited during the year. Croesor Quarry was still in use in June but the only remaining track was in the form of a Y; left hand to a tip, right hand into the sheds, and the other line into the mine. There was no sign of motive power and the slate dressing sheds were surrounded by a very efficient fence. RH 175414 was noted in June at Moel Tryfan and KIDBROOKE was in bits at Minffordd. At Aberllefeni the track of the Ratgoed tramway and the Aberllefeni Slate Company line was lifted from near the houses, although still in place between mill and quarry. The ex−Votty locos were both underground, but a lean−to structure was being built for them on the surface. Parc Mine at Llanrwst was opened in 1952 and worked until 1958. Then the drop in base metal prices and low grade of the ore caused closure, but the mine was reopened in 1962 for about two years‘ experimental work; three RH diesels were present in June. At the Aluminium Corporation at Dolgarrog the track was still in place in August; the gradient is rather steep and is presumably rope-worked. Some track and sleepers have been sold to the Welsh Highland Railway. Finally, on Anglesey, Dinmor Quarry was visited in June. MR 9215 was working stone from the quarry face to the crusher, the other locos (MR 5236, MR 5461 and JF 3900011) being in the shed. The MR‘s were all in a dusty green livery, but the JF was painted green, lined red and edged black – like the FR locos. The following abbreviations have been used in this article. HE Hunslet Engine Company Ltd.
JF John Fowler & Company (Leeds) Ltd.